Building songbird boxes is a simple, inexpensive way to attract songbirds to your property. This factsheet discusses how to build, install, and maintain nest boxes successfully. Properly constructed nest boxes can provide shelter in those areas negatively affected by urbanization and intensive management. By building boxes, you can insure the songbirds on your land a place to nest. Bird species have different habitat needs. To be successful, you must first choose the species you want to attract and understand its food, water, and space requirements. Use the table below to find the proper dimensions of the nest box for the birds you want to attract. 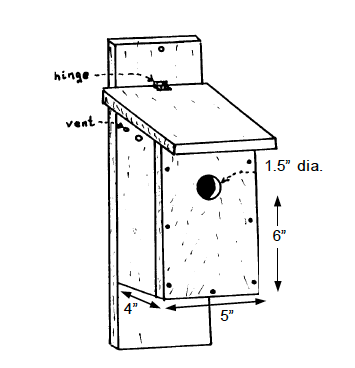 By simply changing dimensions and entrance hole sizes, you can furnish cool, dry, durable, easily-cleaned boxes for any of the small to medium-sized bird species in the table (Figure 1). Boxes need at least four 1⁄4-inch holes in the bottom to allow water to drain. Several 1⁄4-inch holes in the sides will provide adequate ventilation (Figure 2). Use durable woods such as cedar, cypress, and pressure-treated pine. Allow for the width of the sawblade when marking and cutting a board. When using hardwood lumber, drill starter holes for the nails to avoid splitting boards. Hinge the roof or use a pivot nail on one side of the box to make periodic clean-up easier. 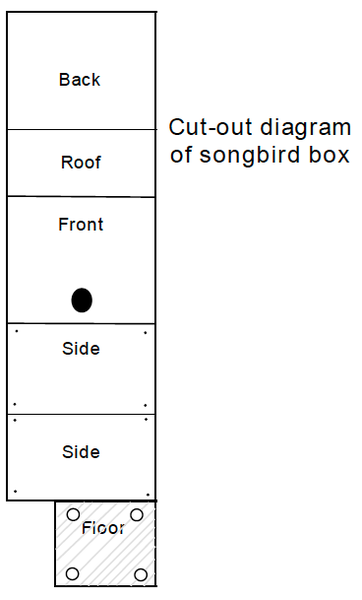 Proper songbird box dimensions for various species. Figure 2. Cutout diagram of songbird box. Install all boxes by late March or early April. Place the boxes 200 to 300 feet apart to account for the territorial nature of most species. Firmly attach boxes to posts, trees, or buildings. On live trees, use crimped wire or lag bolts that can be loosened as the tree grows. Place boxes where they’ll receive some shade during the day. In pasture situations, place the box across the fence from nosy livestock! Clean out all boxes each year after the young have fledged. 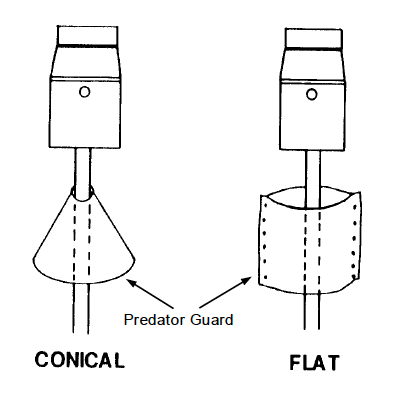 Inspect boxes regularly and consider adding predator guards if necessary (Figure 3). Always work in teams when using folding or extension ladders!